Isn’t it interesting how an Ecuadorian “asylum conditions” technicality, a UK bail technicality and a US whistleblowing technicality all just so happened to converge in a way that just so happens to look exactly the same as imprisoning a journalist for telling the truth? Over and over again that phrase showed up to be unquestioningly re-bleated by the British press in all their reporting on the Assange case: No one is above the law. No one is above the law. No one is above the law. Something tells me they really want people to know that, with regard to Julian Assange, no one is above the law. This is Nice Guy Fascism. You get to act just like a brutal totalitarian regime and then say it’s not because you’re a brutal totalitarian regime…No one is above the law. No one is above the law. As I discussed yesterday, the Trump administration’s extradition request is accompanied by criminal charges which are based on the same information which the Obama administration declined to charge Assange for, a point which has been discussed in more detail in a new article by The Intercept’s Glenn Greenwald and Micah Lee. The Obama administration looked at the evidence and concluded that there was no way to charge Assange with anything without endangering press freedoms, then the Trump administration looked at literally the exact same evidence and said screw press freedoms, we’re going after him. They wanted to punish Assange and show the world what happens to a journalist who exposes US war crimes, so they changed the narrative to make it happen. To get around this problem, the UK, which is functionally just a province within the US-centralised empire, used a bail technicality to justify his arrest. 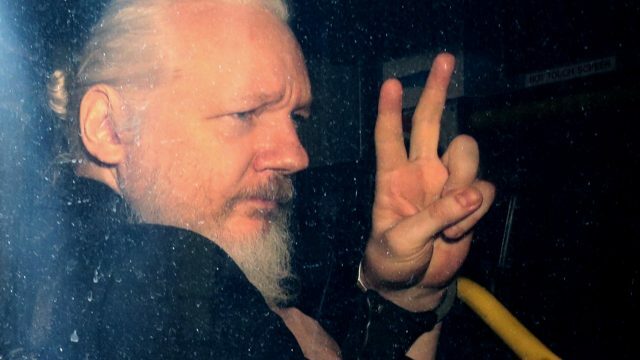 After the Swedish government decided to drop its sexual assault investigation without issuing any charges, Assange’s legal team attempted last year to get a British arrest warrant dropped for a bail violation which went into effect when the WikiLeaks founder took political asylum in the Ecuadorian embassy. The judge in that case, Emma Arbuthnot, just happens to be married to former Tory junior Defence Minister and government whip James Arbuthnot, who served as director of Security Intelligence Consultancy SC Strategy Ltd with a former head of MI6. Lady Arbuthnot denied Assange’s request with extreme vitriol, despite his argument that British law does have provisions which allow for the time he’d already served under functional house arrest to count toward far more time than would be served for violating bail. The British government kept police stationed outside the embassy at taxpayers’ expense with orders to arrest Assange on sight. Manipulators love the rule of law. The most horrific things done throughout history—genocide, slavery, torture, the use of the atomic bomb—all perfectly legal and state-sanctioned in their time. In this way a kind of narrative funnel was created, funnelling Assange from the embassy to British police on the imaginary narrative that Assange had violated asylum conditions and that he needs to serve time for a bail violation, which in turn allows for Assange to be funnelled from the UK into the US on the imaginary narrative that he broke some kind of law by trying to help Chelsea Manning cover her tracks and avoid detection, which is all made possible by the fact that the government of Australia has refused to provide any protection for its citizen. And the end result just so happens to look the same as what you see when a journalist tries to expose malfeasance in an overtly totalitarian government. This is called Nice Guy Fascism. With a little narrative manipulation, you get to act just like a brutal totalitarian regime and then say it’s not because you’re a brutal totalitarian regime, it’s because you’re deeply concerned about the adherence to a specific interpretation of the bureaucratic technicalities of bail protocol. Manipulators love the rule of law, because they are able to twist it toward their infernal ends. It’s always possible to squint at laws in such a way that it allows them to be interpreted to the benefit of the powerful, which is why lawyers are often horrible human beings. All the most horrific things that have been done throughout the history of civilisation have been carried out not by criminals but by law-abiding citizens, because they were perfectly legal under the ruling governments of that time. They want you looking at “the rule of law”. They want you fixated on it. But really “the rule of law” is nothing other than a series of mental narratives which are treated as reality by existing power structures. Assange is a prisoner by narrative, because he punched holes in the authorised narratives of the powerful. Whoever controls the narrative controls the world.